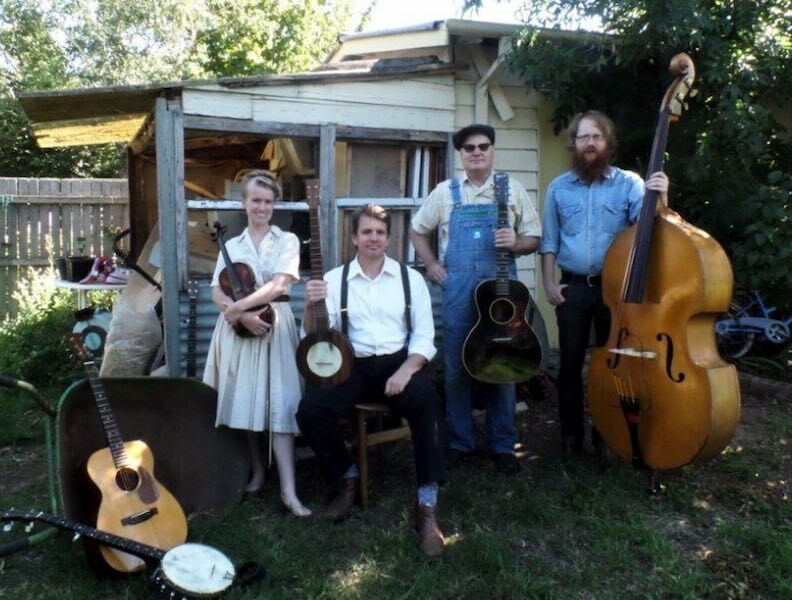 Here is a new band on the old-time music scene. We added the group to our Bands List a few months ago and now we have some more details on the band and its members. The Black Mountain String Band is a joyous celebration of old-time string band music, where fiddles and voices harmonise with the rhythms of the banjo, guitar and double bass. This superb group of Canberra musicians gather around the microphone and share tunes and songs that draw deep from the well of the old-time tradition and have timeless sounding original material. The band is Pablo Shopen on banjo and fiddle; Donal Baylor on guitar, fiddle and banjo; Jacqueline Bradley on fiddle and banjo; and Matt Nightingale on double bass. The entire band sings. The band takes great pride in researching their material and that deep knowledge shows when presenting their act. They keep the old-time string band genre flame burning bright and continue a tradition that began with the first Black Mountain String Band – Pablo’s father’s band from the 1970s, which started old-time music in the ACT. Pablo Shopen grew up playing fiddle with his family in a house full of music from Appalachia to Buenos Aires. Pablo began performing from a young age and with time; he expanded his repertoire of fiddle styles and mastery of other instruments, drawing on the many elements of folk music that thrive in Australia today. Pablo has played with various Canberra bands over the years including The Porch Band, The Tinkers, Horse`s Leotard, Doctor Stovepipe, Rooftop Revellers as well as appearing with many others. Donal Baylor also comes from a rich family background in music, being part of the Baylor Brothers. For more than a generation he has played in such significant bands beginning with Australia’s first Western Swing band, The Dancehall Racketeers, through to other iconic Australian performers as diverse as Mic Conway and Slim Dusty. For the past 14 years he has been the fiddler in Bluegrass Parkway. The Black Mountain String Band gives Donal a chance to reveal some of his other talents. Jacqueline Bradley is a very talented singer, fiddle and banjo player with a love for traditional and old-timey music. Growing up in a family of music, Jacqueline now plays in several bands including Hoddle, the Two Step Trio, Kristabelle and the Southern Jubilee Ringers and the Black Mountain String Band. She has recorded with a various musicians in a range of styles, from Irish music to blues to alt country and is looking forward to a year of playing and recording in 2016. Matt Nightingale is a very in-demand bass player for all manner of musical endeavours as well as being a busy sound designer and engineer. Matt fills out the band sound with the bottom end – both instrumentally and vocally. You can also hear Matt playing bass with Den Hanrahan and the Rum Runners and together with Jacque in their contemporary Irish band, ‘Hoddle’. Follow the band via their Facebook page and you can see and hear snippets from one of their performances at the 2015 National Folk Festival. Their first CD, Time Traveller, is planned to be released in November 2015.